Handi-Bob bobbin holder for sale, for your bobbin-spool connection. with no added shipping and handling. Quantity Orders are available Contact Us !! 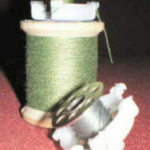 Stores your bobbin on spool to match thread by kind, color and size. Eliminates “lost” bobbins, mismatched threads and tangled thread ends. Re-Usable – Fits most spools and bobbins. Loop end of spool thread on nearest thread lock arm. Bobbin snaps into Handi-Bob® bobbin holder for storage: tilts out of handi-bob to remove for sewing. Either rotate bobbin in place to store loose thread or use nearest thread lock arm to secure thread end. Handi-Bob® bobbin holder fits over bobbin spindle – no need to remove while sewing. Each Order is Special, please use our contact page for a quotes and billing. We will send you an online invoice and you may pay with credit card like any online purchase.